A boost of up to nine per cent in weaning weights can be achieved in steers out of Angus females simply by switching to a Hereford bull. The advantages of heterosis, or hybrid vigour, in black baldy progeny has been quantified with the release of preliminary calving and weaning results from the Herefords Australia Black Baldy trial. The crossbreeding trial is generating controlled, accurate data on the commercial value of crossbred beef genetics using Hereford sires over Angus females. The cattle are being grazed at Cape Portland and Nabowla in Tasmania under the management of Musselroe Beef. The crossbreeding trial is a partnership between Herefords Australia, Adelaide University, Meat and Livestock Australia and Musselroe Beef. Live, carcase and meat eating quality data is being collected on the progeny through the supply chain, from birth to slaughter, and analysed by University of Adelaide professor Wayne Pitchford. Reproductive capacity data, including age of puberty, is also being collected on the black baldy and Angus heifer progeny. About 600 commercial Angus females were artificially joined to 11 industry leading Hereford sires, along with Angus as a comparison. All sires used in the trial were genotyped with a Geneseek HD SNP (150k) and all progeny genotyped with a Geneseek LD SNP (40k). Back-up bulls of both breeds were sourced from leading Australian studs and used over the three cohorts. The trial began in spring, 2014 and is due to conclude in December, 2019 with the last cohort of steers to be grass finished and processed in July in Tasmania. Within the project, 40 per cent of the calves were born to two-year-old maiden heifers and the balance to three and four-year-old mature cows. Preliminary results showed Hereford sired steer calves from maiden cows were three per cent heavier at weaning than Angus sired calves, providing a value add to young females in the herd. In the mature cows, Hereford sired steers were nine per cent heavier at weaning over their straight Angus siblings. Professor Pitchford said sire breed differences were not significant for calving ease or calf survival among heifers and mature cows. Among two-year-old maiden heifers, there was assistance required for calves sired by both breeds with no sire breed difference in calving ease for heifer calves, and a five per cent increase in assistance required for Hereford sired bull calves. Hereford sired black baldy calves were six per cent heavier at birth. Prof Pitchford said using Angus bulls over heifers would reduce the risk of calving difficulties, and using Hereford bulls over mature cows would add growth. “As an example, if a commercial Angus herd of 100 cows had 20 heifers and 80 mature cows calving, use of Hereford bulls would mean assisting in only an additional three calves but get the production of an extra 1600kg of weaning weight,’’ he said. Prof Pitchford said the trial’s calving data was completely transparent to the wider industry. “We are open to potential challenges but even on weaning weights the increased potential is quite substantial, and we still have carcase weights and female reproductive traits to come,’’ he said. Herefords Australia breed development manager Michael Beattie said carcase and growth information would follow once the final cohort steers were processed. “The weaning data is evidence of the heterosis effect with Hereford sired steer weights nine per cent heavier over straight Angus,’’ Mr Beattie said. “The trial is quantifying the benefits of heterosis which commercial black baldy producers have taken advantage of for a long time. “At the end of the day, it is about producing more kilograms of quality beef per hectare. 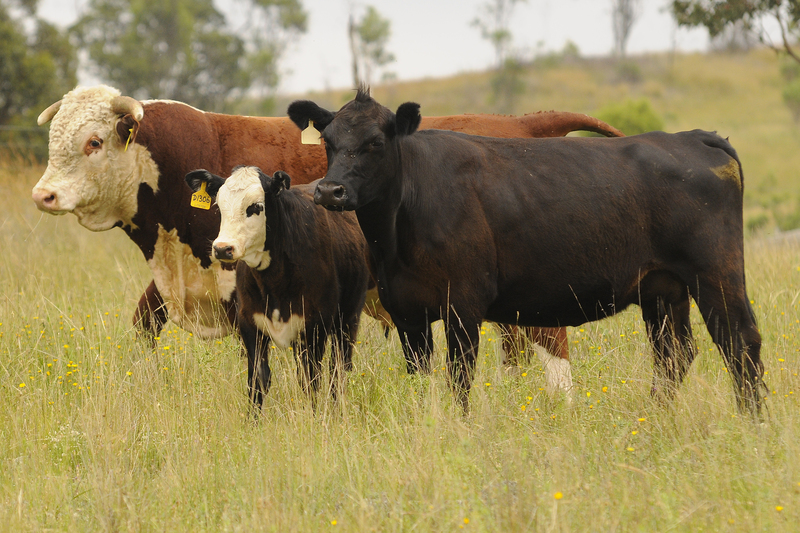 Herefords Australia plans to roll out workshops on the economic benefits of black baldy crossbreeding programs during 2019. Herefords Australia general manager Andrew Donoghue said it was tremendous to see findings of the much-publicised trials conducted in the USA held true under Australian conditions. “The Hereford breed has experienced a significant resurgence throughout North America as an asset in crossbreeding programs of any colour, in fact, more cows will be bred to a Hereford bull in the USA this year than ever before,’’ Mr Donoghue said. “We are excited for this trend to be established in Australia. “To date, added weaning weights have proven the worth of a Hereford sire in a terminal breeding program. “During the next stage of our research we are excited to prove the added maternal value of the Hereford F1 cow based on added fertility and longevity – core profit drivers in any business. A full report containing all results from the Black Baldy project is planned to be release in the second half of 2019.